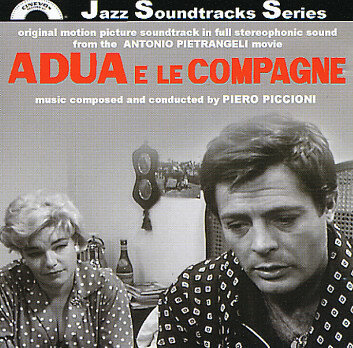 Piero Piccioni's score for Adua e le compagne is the 376th Soundtrack of the Week. It's 1960 and we're in Rome. The atmosphere is smoky and so is this swingin' jazz soundtrack. If this were released as an American jazz LP in the '60s it probably would have been a hit. There's strong soloing throughout, particularly from piano, guitar and alto saxophone, and the arrangements are well done. There's also some more conventional scoring, using strings and such. But it's really the jazz quotient that makes this soundtrack special.